Size: 410 sq.ft. - 1042 sq.ft. Royale Lifespace introducing a landmark residential project "Royale City" in Asangaon, Mumbai. It is offering lavish thoughtfully designed residential apartments. 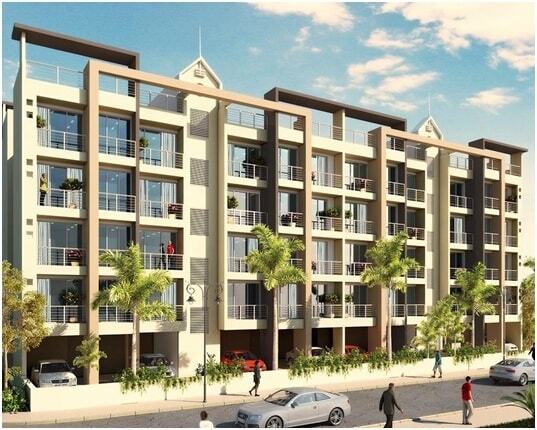 This mega project is offering 1 RK, 1 BHK and 2 BHK homes. The residential complex is provided with lots of modern features and facilities. Royale City has provided unique features. The Royale City housing complex is gifting a new life with joy and happiness. This lavish project is constructed between lush green environment and scenic landscapes of Sahyadri mountain range.The apartments of Royale City have adequate ventilation and natural lights. This mega development offers choices from 1 BHK, 2 BHK apartments & 1 RK apartments with size ranging from 410 Square Feet to 1195 Square Feet. Royale City is having 25 towers with 500 units in total.The extraordinary designs of the apartments that come with spacious rooms and the unique amenities make this project more delectable. This mega township at Asangaon is at walkable distance from station, an atractive residential complex situated in a very prominent area of Mumbai. The project area enjoys an abundance of rich social infrastructure. This project offers the best aspects of city life close to nature. The Royale City location promises number of advantages to the investors and buyers. The Mumbai-Nashik Highway and the Asangaon Railway Station can be reached in 15 minutes. Asangaon location is well connected with the Mumbai-Nashik Expressway and other centres. The project is located in a chemical free zone where there is zero noise and air pollution. Royale City rate is affordable with all these features and locational advantages. The complete address of Royale City is Asangaon East, Beyond Thane, Mumbai. Royale City is blessed with extraordinary amenities and features incorporates grand entrance gate, swimming pool, kid’s pool, fully equipped AC gymnasium, indoor games, meditation and yoga room, German designed landscape garden, children’s play area, jogging and cycling track, party lawn, multipurpose hall, Jain derasar within complex and place of worship for all religions, shopping zone, health care centre, good electrical fittings, decorative designed rooms, good quality fixtures for washrooms, etc. Schools –RatanBai S. Damani School, Kidzee, Ratanbai S. Damani School, Zilla Parishad School Walshet. Bank/ATMs – ICICI BANK ATM, Bank Of India ATM, TDC Bank ATM, Bank of Maharashtra ATM, HDFC Bank ATM, Bank of Baroda ATM, State bank of India. Pharmacies – Chetan Medical, Bhushan medical, Get Well Chemist, Shivam Medical And General Stores. Shopping Centres – Black Collection, vinod cloth store, Kabadi Plaza, Rathi Osho Dhara. Hospitals – Acharya Tai Hospital, Hari Om Clinic, Raviraj Hospital, Arya Hospital, Hospital Deep Smruti Nursing Home. Petrol Pump – Suvidha auto service, HP Petrol Pump, Agarwal Petrol Pump. Restaurants – Ajju food cafe, Maratha Khnaval Veg And Nonveg, McDonald’s, Navinya Chinese Centre Pure Veg Chinese. 410 sq.ft. - 1042 sq.ft.